Every so often I come across an argument against the Book of Mormon that I feel I have to respond to in some way. Some arguments are so trivial that they can be dismissed out of hand but there are a few that look damaging on first view but with a little thought and additional information the apparently damaging argument loses its bite. The hardest ones are the arguments that are presented in a seemingly logical manner with numbers, facts, figures and even references to reputable sources yet have some underlying, yet not immediately apparent failing that invalidates the argument. The thing that makes these arguments so hard to counter is the fact that they take time and lots of understanding to expose the underlying failing that is fatal to the entire argument. A while back I came across an argument that attempted to prove that the Book of Mormon could not have occurred in the real world, that is, it was a work of fiction. There are many such arguments but for some reason this argument stuck with me, not because I believed it or thought it had any merit but because I could not come up with what I felt to be an adequate response to the argument. I could very easily point out the major fallacy of the argument but I was having a hard time arranging a sufficient counter argument with enough data to consider the issue settled. "Even the most unbiased person must look at the facts and numbers that history and demographics provide and come to the undeniable conclusion that the numbers just don't add up. One can prove the Book of Mormon wrong by using a simple $1.99 calculator and a few books on world demographics. Sadly, even in the light of such obvious facts, some of the best and brightest and most sincere people the world has to offer have fallen for the lies of the Church of Jesus Christ of Latter-day Saints." Well I don't have a simple calculator that costs $1.99. I have a $500 computer with some expensive software. So I guess that is why I came to a different conclusion than this particular anti-Mormon critic. "Population growth during this pre-agricultural period was virtually nonexistent, roughly .0001 percent per year or less. This is an established fact that can easily be confirmed. (Parsons, Jack. Population versus Liberty. London: Pemberton, 1971, 33; Miller, G. Tyler. Living in the Environment. 4th Ed. Belmont, MA: Belmont, 1985, 88-91; Ehrlich, Paul R., and Anne H. Ehrlich. Population Resources Environment. 2d ed. San Francisco: W. H. Freeman, 1970, 6)"
Citations in the original text. So the essential part here is that in historic times the average population growth rate was very small (we will overlook the fact that he first cites the rate of 0.0001% which would only be true for a non-agrarian, hunter-gather society, despite the fact that there are ample references to Nephite and Mulekite societies being agrarian, non-hunter-gather societies and thus would have a higher average population growth rate). So here is the problem. Given the very small historic (or pre-historic) average population growth rate of 0.0001% (or 0.3%, or 0.04% depending on which part of the article you are reading, the author is never quite consistent nor does he settle on a number) it would be impossible for the less than 100 original settlers to reach a population of 600,000 people within 500 years. That would require a population growth rate of 2% (not 0.2%, 2.0%) which, as the author points out, is a rate practically unheard of until modern times. To make this case the author includes a table with "Average Percent Annual Global Growth Rates" from a variety of different sources. While there is some difference among the different sources they are all fairly consistent and agree that the "Average Percent Annual Global Growth Rate" before 1650 was 0.3% or lower, which is what our anti-Mormon critic seizes on to make his case. When I first heard this argument I could tell it was fallacious on the face of it because it confuses the "Average Percent Annual Global Growth Rate" with a local non-average population growth rate. Given the concept of an average we should expect there to be years, or even several years, where the growth rate is above average, and several years where the growth rate is below average. This would be true for a specific location. When we take those fluctuations from location to location, all over the world, and average them together we get the global average. Local populations may vary from year to year, or from century to century, but on average the global population growth rate is fairly consistent. So essentially the author is fundamentally misunderstanding (either intentionally or unintentionally is hard to tell) what the average global population growth rate really means. It would be like saying that the average temperature where you live could not have risen by 20 degrees over the past six months because the global average surface temperature is only rising by 0.3 degrees per decade. Our esteemed critic seems to have a hard time understanding the concept of a global average. But what would be a reasonable population growth rate at that time? This is the question that had me stuck for a while. It is easy to point out that there is a difference between a global average and a local population growth rate, but is it reasonable to have a 2% growth rate in a pre-modern society? To answer this let us look at the population of Rome during the Roman Republic. The history of Rome provides a good analog to the time period in question from the Book of Mormon because it happens at approximately the same time and has a few similarities that allow for a good comparison. To be sure there are some very important differences, but those differences can also play into our discussion here. The Roman Republic was founded in 509 BC and officially lasted until Octavius was proclaimed Caesar Augustus in 27 BC. So just like in the Book of Mormon we have an agrarian society centered on a city state that covers approximately 500 years in the first millennium BC. Also during that time there are several wars, but also some territorial expansion and the integration of surrounding populations into the city state. We don't have population data for the Nephites and Mulekites but we do have some of the data for Rome. Below I have a graph of existent Roman Census data. 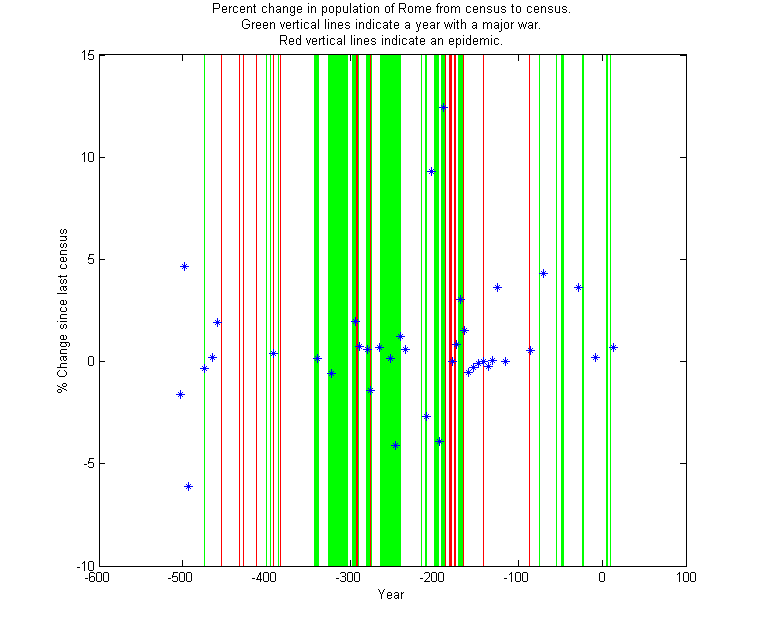 Blue crosses are census data with green lines indicating a year where war impacted the population of Rome. Red lines indicate years with major epidemics. I did not include years of economic crises. These census data are a bit complex because these only give the number of freemen who hold property and thus are eligible for military service. These numbers do not include slaves, women or children (generally, though there are a few censuses where this rule was not followed). The population ranges from about 100,000 men around 500 BC to more than 4 million in 14 AD. Below I have the percent rate of population change per year calculated from the previous census. The actual population of Rome is a matter of intense debate among scholars. There may also have been a few censuses where the numbers are different from the other censuses because they changed the way they counted freemen or citizens. But one thing we can see from the graph showing percent change per year is that there were several periods of a population decrease, no change, or population increase. Some of the percent changes are quite dramatic such as an average drop of -6% per year for five years. Others time periods, such as in the first century BC (from about 86 BC to 26 BC) saw an average population growth rate of 4% per year, for 60 years. During that time the population of Rome went from about 460,000 freemen to just over 4,000,000 freemen* (*some debate about whether or not this number includes women and children, but no hard evidence). Not an insignificant change. The other thing to realize here is that during this time there were several major wars that affected the population of Rome. For example, in 387 BC the city of Rome was burned to the ground and almost abandoned. Yet a little over 100 years later Rome fought Carthage in the First Punic War which resulted in more than 155,000 Roman soldier deaths while fielding approximately 700,000 soldiers over the course of the 23 year war. Not to be outdone, 23 years later Rome and Carthage engaged in the Second Punic War in which Rome fielded more than 782,000 soldiers and lost more than 300,000. That war only lasted 17 years and saw Rome directly threatened by Hannibal. At this time Rome had a policy of using land holding, free (non-slave) soldiers in their armies. 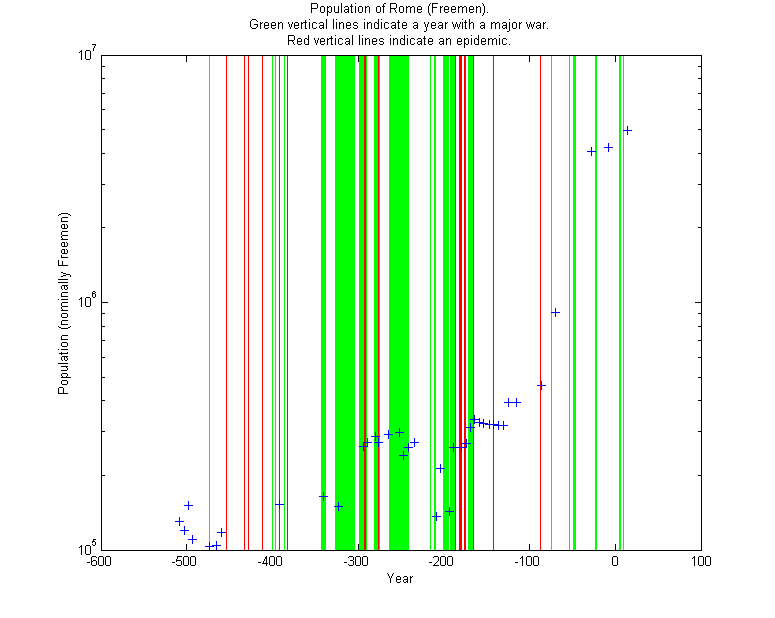 You can see significant drops in the population of Rome during these wars. At several points Rome was losing on average 4% of its population per year due to these wars. Yet the population rebounded within a few years to the point that in 200 BC Rome was invading Greece and beginning to take control of some of the lands conquered by Alexander the Great. While the average population growth rate per year may fluctuate wildly we can also take the population data and by doing a linear fit of the data we can see that the population grew about 0.3% per year over the course of the Roman Republic (hmmm, so that is where all those historians came up with 0.3% per year for population growth before 1650). But this nominal rate of 0.3% per year masks some of the wild ups and downs of Rome during that time. It does not show the hundreds of thousands lost in the Punic Wars nor the incredible population growth in the lead up to the start of the Roman Empire and the end of the Republic. If you insist on a population growth rate of 0.3% or lower for all dates before 1650 then there are a great many empires and nations, and not just the Romans, who long would have been wiped off the map from war and disease. Essentially if our anti-Mormon critic were to apply the same logic that he uses on the Book of Mormon to Rome he could very easily disprove the reality of the First and Second Punic Wars. "Even the most unbiased person" who insisted on a strict population growth rate of 0.3% per year could use his $1.99 calculator to disprove the existence of the Roman Republic and the later Roman Empire. Our critic may argue that Rome was a special case, or that the population of Rome was inflated by immigrants (never mind the fact that the Romans were picky about who could call themselves a Roman citizen, until the Empire came along that is). But there were so many other Empires throughout history with comparable losses in battle that without occasional periods of higher than average (0.3%) population growth we all would have died out long ago. To our anti-Mormon critic the numbers may seems incredible but given our recorded history the numbers and approximate populations in the Book of Mormon should not come as a surprise. A population growth rate of 1.1% per year, sustained over 1000 years, Dr. Diamond calls trivial and notes that higher rates "have been observed in modern times when people colonized virgin lands". In the case of the Nephites and Mulekites in the Book of Mormon we have two groups of people moving into apparently sparsely populated, but not entirely empty land, and then 500 years later fighting wars that would require a total population of 600,000 people or more. Surely this is within the realm of possibility given what we know of demographics throughout history. As a final example we can read in the Bible about the children of Israel who entered Egypt with 70 souls (plus Joseph and sons), yet when they left 430 years later they had 600,000 men, which would mean a total population of roughly 2 million people. These numbers would require an average population growth rate of 2.4% per year to accomplish this. While there may be some anti-Mormon critics who would have no problem using this fact to discount both the Book of Mormon and the Bible, I find it slightly satisfying that for those critics who hold to the Bible, and only the Bible, the numbers presented in the Bible require a larger population growth rate than the rate they claim disproves the Book of Mormon. By their own logic the Bible they hold so dear has been shown to be a fraud. Unless you use something more than a $1.99 calculator and a basic understanding of what an average population growth rate is. First off, I'd like to know where you can actually buy a $1.99 calculator that can do statistics. Sure, I can buy a $.01 calculator on Amazon (plus $4.99 shipping) but that doesn't solve anything. Many anti-Mormons use broad generalizations or false analogies in order to "prove" the reasonableness of their argument. You've identified the basic fallacy with this gentleman's argument, namely the use of the worldwide average to "disprove" local phenomena. The real question remains, however, of why some people go to such lengths to argue against beliefs they don't hold themselves. Sure, we can understand why someone would engage in apologetics in order to defend the faith, but to attack the beliefs of Mormons is truly the mystery of the Nehors. Euripides, I don't think they go to great lengths (well some do, but not all) to argue against beliefs they don't hold. You are forgetting Hugh Nibley's "How to write an anti-Mormon book", that is, never do your own work, just copy the work of others. The site that I used as reference did just that. They copied the work of someone else. I think they did some editing, that is, they only copied the paragraphs that made (some) sense. So they didn't even do all the work and the guy who actually wrote the thing didn't even do all the original work. So it was just built up over several years by many many people. Still, it took some time for this gentleman to actually sit down and copy and paste a book together. Someone published it. Someone spent money printing it and marketing it. It's such a waste of time and effort for someone who doesn't even believe what Mormons have to say. And you're right about copying other work. There is no other explanation for the rumors, and half-truths, and outright lies told about Mormons that date back to the early 1800s. Check out the growth rate of the Arcadians - French-speaking Canadians. From a few thousand initial immigrants they were one if the fastest growth rates of all time. Thanks Sandy. I looked into a lot of different population growth rates before I wrote this and settled on the Rome because they were definitely pre-industrial, and also had a lot of data. I could also point out that the three countries with the highest infant mortality rates (Afghanistan, Mali and Somalia), all have population growth rates greater than 1.5%. And it's not like people are lining up to move to those countries so all the population growth comes from internal growth. They also don't have modern working health care systems, or even health care systems at all. So even without modern medicine and stable societies they still manage high population growth rates.